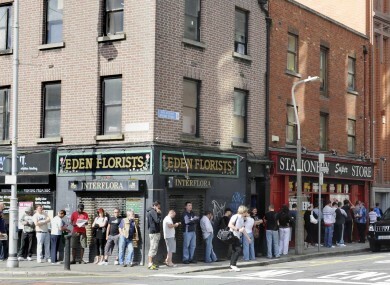 File photo of people waiting outside a social welfare office. THE AVERAGE WAITING time for an initial decision in a social welfare appeal is 27.8 weeks – about seven months. It’s usually several more weeks or months before oral hearings take place. The longest waiting period for a summary decision is for appeals relating to Occupational Injury Benefit (Medical): 78.7 weeks or close to 20 months. Summary decisions related to the Pre-Retirement Allowance usually don’t happen for almost 14 months (54.6 weeks). The waiting time in terms of child benefit decisions is almost a year (47.1 weeks). People appealing decisions related to Jobseeker’s Allowance have to wait an average of six months (24.4 weeks) for an initial decision, while those waiting to hear back about a Respite Care Grant appeal usually won’t have a summary decision for seven months (28.5 weeks). Tánaiste Joan Burton revealed the figures in the Dáil recently, in response to a parliamentary question asked by Bernard Durkan. Burton said appeal processing times peaked in 2011 when the average time for an oral hearing was 52.5 weeks and 25.1 weeks for a summary decision. In 2012 the average processing time for an oral hearing dropped to 39.5 weeks and the time for a summary decision increased slightly to 27.8 weeks. Last year the average appeal processing time reduced to 33.9 weeks for an oral hearing and 25.8 weeks for a summary decision. As of 30 November 2014, the average time taken to process an appeal requiring an oral hearing was 28.7 weeks and for a summary decision was 21.4 weeks. The below tables give a breakdown of how long people have to wait, on average, for decisions in social welfare appeals. Appeal processing times are calculated from the registration date of the appeal to the date of its finalisation. Burton noted that while this process “carries an inherent delay in terms of finalising an appeal, it also crystalises the flexibility and accessibility of the appeals system”. By its nature and because it is a quasi-judicial function, the processing of appeals takes time and reflects the fact that, by definition, the appeal process cannot be a quick one. Burton said “a rapid and sustained increase in the number of appeals received in the Social Welfare Appeals Office since 2009″ has placed “extraordinary pressure” on the office. Up to 2009, the average number of appeals received was 15,000 per year. In 2012, the number of appeals received peaked at 35,484, reducing to 32,777 appeals in 2013. The Tánaiste said that 41 people currently work in the appeals office, noting that additional employees have been hired to “manage this increasing workload”. In addition to the improvement in processing times, these measures have also led to a significant increase in the annual number of appeals finalised in the appeals office from 17,787 in 2009 to 38,421 in 2013. An additional 5,863 appeals were finalised in 2013 compared to 2012. “Good progress has also been made in reducing the number of appeals on hand from 20,414 at 1 January 2013 to 9,769 at 1 December 2014,” Burton added. As of 31 October 2014, 3,717,582 people were in receipt of social welfare payments and a further 59,252 payments were pending approval. Some 3,644,871 people were receiving payments at the same time last year, while 68,000 claims were awaiting approval. More than 1.6 million claims were registered from November 2013 to October 2014. The most commonly paid claim in 2014 was Free Travel (809,155 recipients); followed by Child Benefit (613,284) and Household Benefits (413,019). Some 265,705 people received Jobseeker’s Allowance this year, down from 286,667 in 2013. Email “Appealing a social welfare decision? Sit tight, it'll be a while”. Feedback on “Appealing a social welfare decision? Sit tight, it'll be a while”.